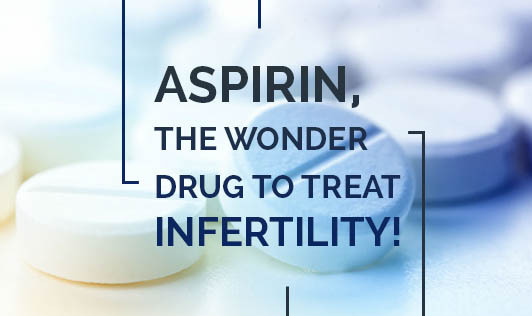 Aspirin, the Wonder Drug to Treat Infertility! When we hear the name aspirin, we associate it with an "over the counter" analgesic for pain relief or a mild anti-inflammatory drug. This magical drug can do wonders from saving a person from a heart attack to bringing in a new life by treating infertility. Yes! Aspirin, is used to treat infertility! New Research shows that aspirin plays an important role in treating infertility. Antiphospholipid antibodies (APA) are a class of proteins related to the problems of coagulation (blood clotting). Women who have high APA levels in their blood can have clotting problems in the placenta, interrupt blood flow and consequently lead to recurrent and spontaneous miscarriages and also make conception difficult. Aspirin helps to thin out blood in women who are experiencing clotting problems. When started with low doses of aspirin, it makes platelets less sticky, allowing blood to circulate more easily through the placenta and to the baby. Aspirin is given in combination with heparin, an anticoagulant medication. Recently, a number of studies have been done on aspirin and its effects to treat infertility. Studies were conducted on women who had multiple miscarriages and women undergoing IVF treatment. They were given low dosages of aspirin every day. Pregnancy rates were then compared between the groups who received aspirin therapy and who didn't receive aspirin therapy. The results were surprising to the researchers, as 45% of the women who were on aspirin became pregnant when compared to 25% of the group who didn't receive aspirin. Recent studies also show that aspirin helps in increasing pregnancy rates in all women. It is known to increase the activity of the ovaries, enabling it to mature multiple eggs during ovulation. Aspirin also improves blood flow to the uterus allowing for a healthier and thicker uterine lining. There are lots of studies being conducted on the side effects of aspirin as well. It is currently acceptable when taken with heparin. Aspirin is taken orally in small daily doses. Long term use of aspirin is not recommended as it may prevent the follicles from maturing and thus inhibiting ovulation. Aspirin should not be taken by women who are allergic to it and who have gastric inflammation and bleeding. Aspirin should be taken under strict supervision from a licensed health care provider. "So if your gynecologist starts your treatments for infertility with a prescription of aspirin, don't get surprised, feel good about it and follow it as per the instructions."